These are 3 common conditions of the eye that can cause redness in the eye and eyelids. Sore eyes or Conjunctivitis is the inflammation of the white of the eye. Different types of conjunctivitis have slightly different symptoms. In general, the conjunctiva becomes pink to very red and the person starts tearing may have an increased sensitivity to light. The person also has blurred vision when the condition is severe. Conjunctivitis may be due to an infection (such as virus or bacteria), due to allergy or due to a chemical injury. Identifying the cause correctly is crucial in guiding treatment. Allergic conjunctivitis is treated with anti-allergic medication and lubricants, while bacterial conjunctivitis is treated with anitbiotics and lubricants. The colloquial term “Sore Eyes” usually refers to viral conjunctivitis. This is treated with lubricants and, if severe, with steroid eye drops. The virus can be transmitted through the tears. It is therefore important for the individual to wash his hands well after touching his eyes to avoid transmitting the disease to his relatives or colleagues. Pterygium (pronounced ‘ter-ee-jium’) is a fleshy, triangular growth of the conjunctiva (white of the eye). Excessive sunlight exposure, dusty environment and one’s genetic predisposition are causes of this condition. A pterygium can occur in either eye, but most patients get it in both, with one eye being more affected. Surgery is required when the pterygium has grown towards the centre of the cornea and begins to block one’s vision. Vision can also be affected due to an increase of astigmatism. The pterygium patient will have dry eyes which require regular application of a lubricant for relief. This is because the pterygium creates a bump on the surface of the eye which prevents the tear film from functioning properly. When the pterygium is not significant, it can be left alone and monitored, though surgery is the only way to remove it permanently. Over the years, doctors have altered their surgical techniques to remove pterygia and cut the recurrence rate of the condition. In the past, surgeons would remove the abnormal tissue and leave the area to heal on its own, in a technique known as bare sclera excision. 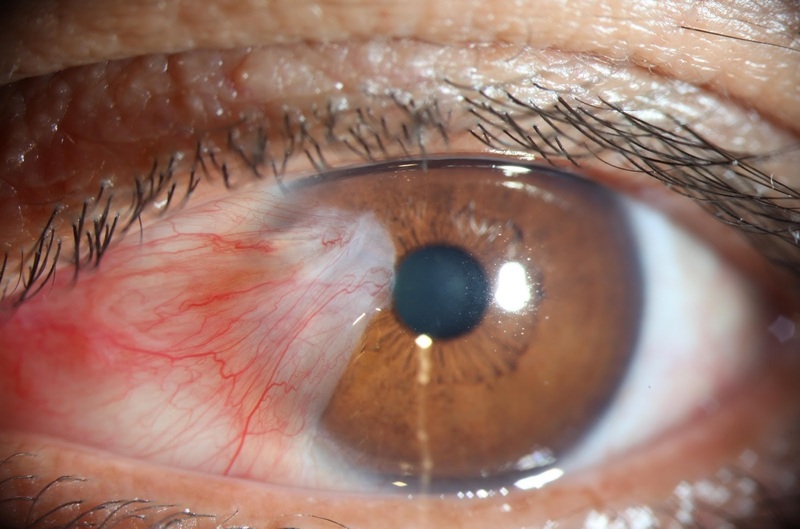 Following this procedure, the affected area of the eye may have a tendency to grow more conjunctiva than it should, hence increasing the risk of pterygium recurrence. These days, the bare area is covered with the patient’s own conjunctiva, taken from the same eye and attached using sutures or a special adhesive known as fibrin glue. With this “cover”, patients do not have to wait for their conjunctiva to grow back on its own. The process is much like a skin graft done on other areas of the body. The fibrin glue method is better than the suture option as it provides greater post-operative comfort, a shorter recovery period and a lower rate of recurrence. A stye (chalazion) is a pimple or abscess that forms in the eyelid. 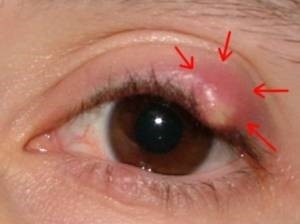 It is an infection caused by blockage of the oil gland of the eyelid. It turns into a red, painful bump that may last several days to weeks before it bursts and then heals. Some styes are short-lived and heal on their own, while others may require the care of your eye doctor. Our doctor will prescribe you with antibiotic ointment to be applied onto the stye. You will also be advised to use a warm towel to warm up the area where the stye is. This allows the oil that is blocked in the oil gland to become warmer and more fluid and easier to flow out. In some people, our doctor may advise a small surgical procedure called Incision & Drainage (I & D) to express out the pus.